In November 1688 William of Orange landed at Brixham with an invasion force of 15,000 men. Support for James II began to ebb, and there were many Protestant desertions from the English army. James II fled to France in December 1689, with William and Mary beginning their co-regency in February 1689. To my Lord Molyneux's Son William a Colonel's Commission for a Regiment of Horse, with Blanks for all his Inferior Officers to be filled up as he should think fit. To Thomas Tildesley Esq; the like for a Regiment of Dragoons.To Dalton of Thurnham, Esq. the like for Dragoons. To Sherbourn of Stonyhurst Esq; the like for horse. To Townley of Townley Esq; the like for Horse. To Girlington of Girlington Esq; a Colonel's Commission. To Westby of Mobrick Esq; the like for Dragoons. Thomas Tyldesley who received a commission was, of course, Thomas Tyldesley 1657-1714, the Diarist. Or, as he is known in many of the later documents, Colonel Tyldesley. 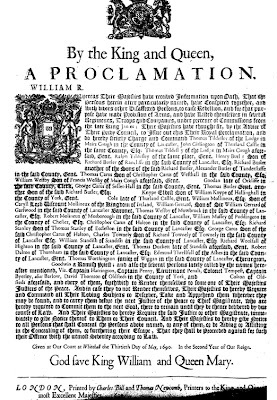 Whereas Their Majesties have received Information upon Oath, That the Persons herein after particularly named, have Conspired together, andWith divers other Disaffected Persons, to raise rebellion, and for that purpose have made Provision of Arms, and have Listed themselves in several Regiments, Troops and Companies, under pretence of Commissions from the late King James; Their Majesties have thought fit, by the Advice of Their Privy Council, to Issue out this Their Royal Proclamation, and do hereby strictly Charge and Command Thomas Tildesley of the Lodge in Mairs Cough in the County of Lancaster, John Girlington of Thurland Castle in the same County, Esq; Thomas Tildesley of the Lodge in Mairs Cough aforesaid, Gent. Ralph Tildesley of the same place, Gent. Henry Butler Son of Richard Butler of Radcliffe in the said County of Lancaster, Esq; Richard Butler another of the Sons of the said Richard Butler, Alexander Butler of Tanderstaffe in the said County, Gent. Thomas Carus Son of Christopher Carus of Westhall in the said County, Esq; William Westby Son of Francis Westby of Mairs Cough aforesaid, Gent. ____Goodan of Orkliffe in the said County, Clerk, George Carus of Seller-Hall in the said County, Gent. Thomas Butler Gent. another Son of the said Richard Butler, Esq; ____Knype Eldest Son of William Knype of Hallinghall in the County of York, Gent. ____Cole late of Thurland Castle, Gent. William Mollineux, Esq; Son of Caryll Lord Viscount Mollineux of the Kingdom of Ireland, William Gerrard, Son of William Gerrard of Garswood in the said county of Lancaster Baronet, Thomas Westby of Mowbruck in the said County of Lancaster, Esq; Robert Molineux of Mosbrogh in the said County of Lancaster, William Massey of Puddington in the County of Chester, Esq; Christopher Carus of Halton in the said County of Lancaster, Esq; Richard Stanley Son of Thomas Stanley of Eccleston in the said County of Lancaster Esq; George Carus Soon of the said Christopher Carus of Halton, Charles Townely Son of Richard Townely of Townely in the said County of Lancaster Esq; William Standish of Standish in the said County of Lancaster, Esq; Ricahrd Woolfall of Highton in the said County of Lancaster, Gent. Thomas Duckett late of Standish aforesaid, Gent. Robert Dalton of Thurnham in the said County of Lancaster, Esq. Edmund Threlfall of the Ashes in the said County of Lancaster, Gent. Thomas Worthington junior of Wiggan in the said County of Lancaster, Chirurgeon (FN1) ____Goodwin a Romish Priest; and also the several persons lately called by the names hereafter mentioned, Viz. Captain Harrington, Captain Penny, Lieutenant Penalt, Colonel Tempest, Captain Byerley, alias Barlow, David Thornton of Oldsteds in the County of York, and ____Colton of Oldsteds aforesaid and every of them, forthwith to Render themselves to some one of Their Majesties Justices of the Peace. And in case they do not Render themselves, Their Majesties do hereby Require and Command all Their Loving Subjects to Discover, Take and Apprehend them wherever they may be found, and to carry them before the next Justice of the Peace or Chief Magistrate, who are hereby required to Commit them to the next Goal, there to remain until they be delivered by due course of Law. And Their Majesties do hereby Require the said Justice or other Magistrate, immediately to give Notice thereof to Them or Their Council. And Their Majesties do hereby give Notice to all Persons that shall Conceal the Persons above named, or any of them, or be Aiding or Assisting in the Concealing of them, or furthering their Escape, That they shall be Proceeded against for such their Offence with the utmost Severity according to Law. Given at Our Court at Whitehall the Thirtieth Day of May, 1690. In the Second Year of Our Reign. LONDON, Printed by Charles Bill and Thomas Newcomb, Printers to the King and Queen's most Excellent Majesties 1690. 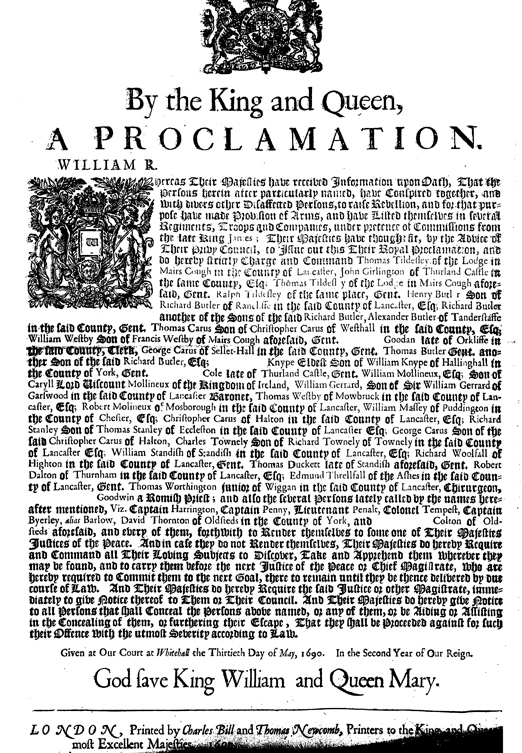 The fact that Thomas Tyldesley 1657-1714 the Diarist is the first conspirator to be mentioned in this Proclamation is indicative of the central role which he played in the plotting in Lancashire. Who are the other Thomas Tyldesley and the Ralph Tyldesley mentioned? One possibility is that these are the two uncles of the Diarist, who at this time were aged around 58 and 56 respectively. 1. Chirurgeon is an archaic term for surgeon.